This deep into winter, we’re starting to run out of the standard (in our house) local butternut squashes so have started braving some of the more exotic and storage-proof varieties. We got a hilarious 12 pound hubbard squash from our local food co-op (Idaho’s Bounty) a few weeks ago. That baby wasn’t gonna win any beauty contests (and I’m so sorry I forgot to take a picture of it so you could share in the giggles), but it turned out to be a tasty bugger! After a slightly ridiculous wrestling match with it and the butcher knife (again, wish there was a video for you), I got it in half and into the oven. I don’t have any hints for you on an easy way into these guys, but just consider it an efficient use of time–entertainment and exercise for the day while prepping dinner. Once you get the squash in half, remove the seeds and roast it, open side down on an oiled baking sheet for an hour at 375 (or until the flesh is tender when you prick it with a fork). Once done, remove from oven and let cool slightly. While the squash is in the oven, sauté the leeks in a large soup pot until tender. Add kale and continue sautéing until wilted. Remove from heat until squash is ready. Heat everything in the soup pot together and simmer until the kale is nice and tender. Add more broth if necessary to get your desired thickness for the soup. 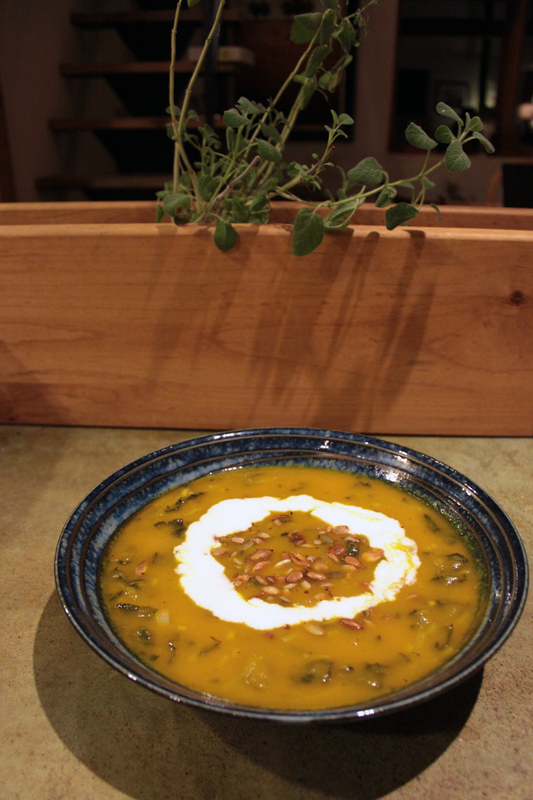 Sprinkle roasted pumpkin seeds on top and drizzle with kefir (if you want) when you serve it. I tend to prefer foods with some texture and body, so while I puree the squash in this recipe, I leave the kale and leeks to provide some interest. If you prefer soups that are completely smooth, just throw the sautéed kale and leeks in with the squash when you puree it. This entry was posted in Recipes, Soups and tagged Candida Diet, Gluten-Free, Vegetarian by Brooke Bonner. Bookmark the permalink.